41 Via Alcamo, San Clemente, Ca. This gorgeous Tuscan-style home in San Clemente is located on a spacious pool-size lot on a quiet cul-de-sac. It has five bedrooms, 5.5 baths and 5,400 square-feet of living space. Built in 2009, this two-story home is both impressive and practical. It’s artfully-designed floor plan portrays a wonderful understanding of the needs and desires of today’s family. The main floor of the home boasts a formal living room with fireplace, an office/library, formal dining room and a spacious family room with fireplace. The first floor is also home to an exceptional gourmet kitchen that features a walk-in pantry, as well as a main floor bedroom with private bath. There is a romantic master suite with private balcony on the second level. The master also has a walk-in shower, soaking tub, his & her vanities and two walk-in closets. Upstairs you will also find a large bonus room and three secondary bedrooms—all of which have their own private bath. 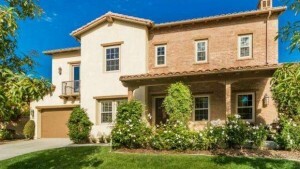 That’s just the beginning when it comes to this San Clemente home for sale. There is also a private backyard that features a covered dining area and plenty of room to play. By owning this home you will also be in close proximity to the Talega Shopping Village, hiking trails, a community pool and park. All of this can be yours for $1,599,000. According to Zillow.com, this home most recently sold in April 2010 for $1,125,000. The mortgage calculator estimates the monthly payment to be $6,827.27 given 20% down on a 30-year loan with a 5% interest rate. For more information, click here.